Coyotes are not strictly nocturnal. They may be observed moving about during the day, yet are more active after sunset and at night. Seeing a coyote during the day does not necessarily mean it is sick or unhealthy, but caution should be exercised with coyotes as with any wildlife. Coyotes do not migrate. They are year-long residents and typically inhabit an area known as a home range. They are territorial, and will firmly defend portions of their home range. 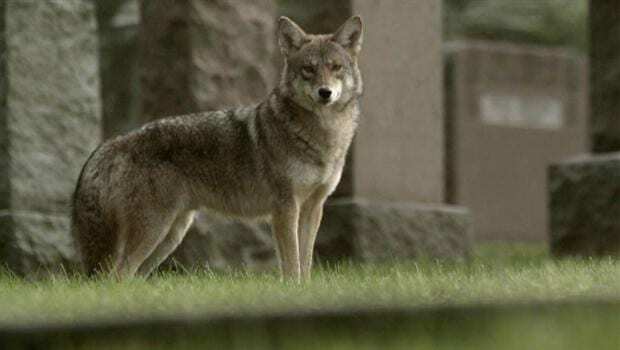 Adult coyotes live in home ranges throughout the year in New York; however, they may shift their activity patterns during the four seasons. Coyotes are monogamous and mate for life. After mating in January, gestation lasts approximately 62 days after which females give birth in March and April. In spring, female coyotes use dens for raising pups and often stay close to these sites. Male coyotes may travel greater distances to hunt more intensively while seeking additional food to support the female and pups. Litters are born in ground dens, brush piles, under downed trees or human structures such as sheds and other buildings. Typical litter sizes are approximately 4-6 pups. Coyote pups grow rapidly and are weaned at 5 to 7 weeks of age and abandon den sites around this time. As pups continue to grow in size they also become more independent of their parents, and are occasionally observed moving together in mid to late summer. Coyotes become more vocal in late summer and early fall when it is common to hear groups of coyotes howling and yipping as a group. Pups are fully grown at 9 months and eventually disperse after being driven from their parents’ home ranges. Dispersal occurs in late October-January, prior to adults beginning the reproductive cycle once again. These young coyotes that disperse often travel 50 to 100 miles in search of a vacant territory, find a mate, and enter adulthood as a breeding pair.